Just as purchases are becoming more automatic, generating marketing content also needs to keep up with the times. Automated purchasing systems are more and more in vogue, opening another avenue for strong content marketing to reign. Did you know with the simple touch of a button, consumers are able to receive boxes of cereal, bags of coffee, and jugs of laundry detergent with hardly a thought? Amazon’s latest offering — the Dash Button — is a branded wireless device that allows consumers to efficiently order products right when they think of it. Customers can strategically place the button in their pantry, for example, so they can easily reorder supplies when reaching for the last bottle of water or opening the last bar of bath soap. “Subscribe and save” programs available through retail giants such as Amazon and Target are another way to keep consumers stocked with the supplies they need. These items arrive on a pre-set schedule without the buyer even having to think about it. And subscription-based sales models offered by Dollar Shave Club, Starbucks, and Blue Apron keep consumers clicking through, adding big bucks to corporate coffers. The robotization of consumer spending is changing the current model of marketing, advertising and shopping, according to a recent Harvard Business Review article, and marketers need to be prepared for the next level of automation in order to keep revenues streaming. 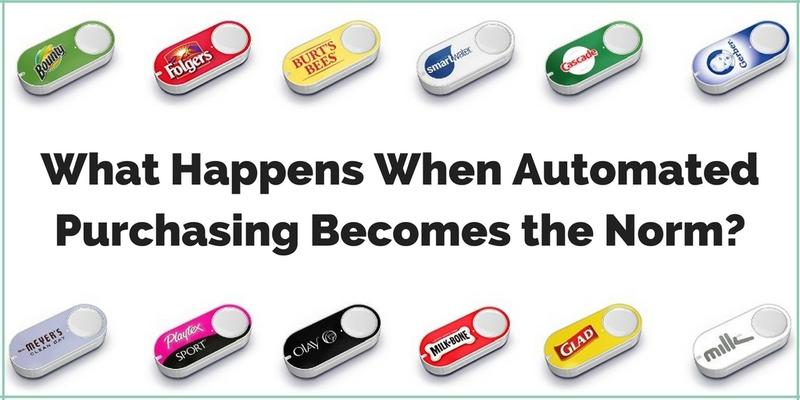 If this automation crosses into the B2B marketplace, suppliers will face new challenges — including finding ways to affect choices of preprogrammed “bots,” such as Amazon’s Dash Button. In this possible and increasingly likely world, HBR posits that advertising dollars will be diverted from traditional models to building relationships, challenging incumbents, increasing rates of consumption, and influencing marketing algorithms. One such algorithm analyzes products that are pre-selected as the default brand in the item’s software (think: the scurry to become Apple’s default map program). Fresh and tailored content that even bots can process will be paramount to targeting content to buyers. In this future scenario, what can brands do to win business from competitors? Certainly, it will take a significant effort to persuade a customer to change the algorithm’s default settings to another product or service. Vendors will have to produce highly targeted, personalized content that demonstrates a deep understanding of the customer’s business and how their product or service will better suit their needs. Interestingly enough, that’s a preference that we’re already seeing among B2B buyers. In the 2016 B2B Buyer’s Survey Report, 69% of buyers said relevant content that speaks directly to the company is very important, signaling that personalized content packages equate to satisfied customers and potential customers. Using content to build relationships will continue to be of utmost importance, even in the age of bot-to-bot purchases. Optimize content to include buzz phrases and recognized keywords, and even bots will get the message.